This is not a sponsored blog post. My extended family has purchased 7 of the various PFCLCD models since 2012, and it's gone well, with just one battery replacement needed so far. I've found them to be very easy to install and configure at friends and family homes. Without a PC, and without a manual. They work great for protecting home virtualization labs, explained in my graceful VMware ESXi shutdown article, with over 6,000 page views, and growing. See also even more popular unboxing and testing video, featured below. Affordability and enterprise-like home computer lab shutdown capabilities are apparently appealing attributes. And now, Microsoft Hyper-V is apparently supported as well. 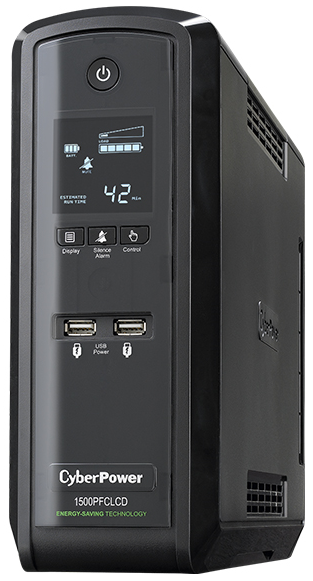 These UPSs are designed for use in North America, here's the CyberPower General UPS FAQ. The roughly equivalent European series is called EPFCLCD as described here and on Amazon UK here. You can mute any of these 4 models by merely pressing and holding the "Silence Alarm" button for 3 seconds. It then confirms, on the LCD display, that it's disabled. Even an extended power outage that depletes the batteries entirely won't re-arm that alarm. That means you won't be awoken in the night to shrill alarms telling you the power has an issue. This makes these models well suited for household use. They even ship with the battery in place, so no special steps to connect the battery/batteries after unboxing. 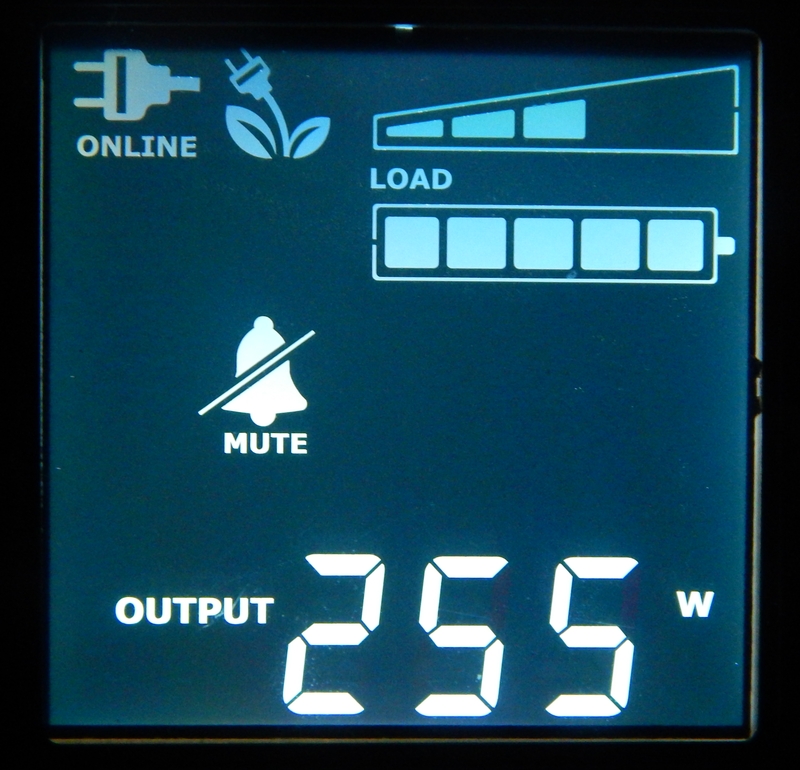 Also helpful is the nice display: with a simple brief touch of any button, the LCD will wake up and tell you your watt burn. Nice! As is the case with all UPSs, you'll want to never put a laser printer or air conditioner through these units, particularly through the battery protected outlets, as explained in the manuals below. When the battery no longer functions after a few years, you can replace just the battery affordably, with all the battery models and shopping links included below. 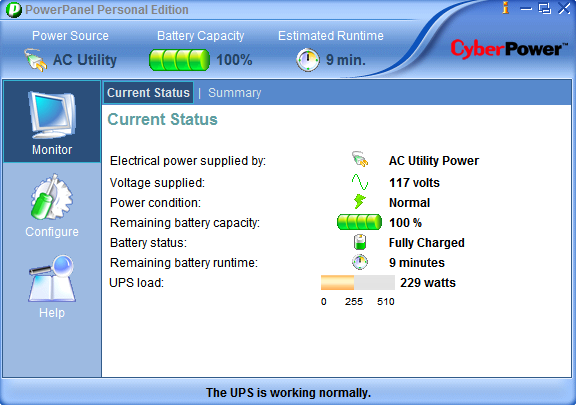 If you are interested in using the monitoring software to help monitor battery runtime and more, CyberPower does a good job with the free Windows/Mac/Linux PowerPanel software, intended to be installed on the system that the included USB cable gets attached to. See also the accompanying FAQ to have a good look at the UI, and consider reading the manual. 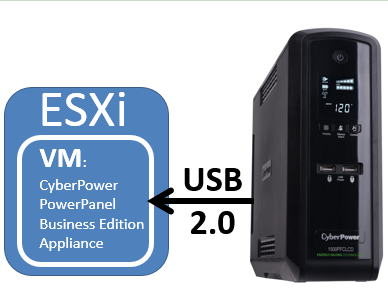 As of Jan 07 2014, the latest version for my vZilla home lab was PowerPanel Business Edition Agent Virtual Appliance 2.3.3 (ESXi, ESX), tested to work nicely and easily with VMware ESXi 5.5, explained here. Pick a size based on CyberPower's sizing guide, then choose the appropriate model below. 1500 VA / 8.5 AH (Amp Hours) x 2 = 17.0 AH, dimensions 3.9" x 10.4" x 14.2". 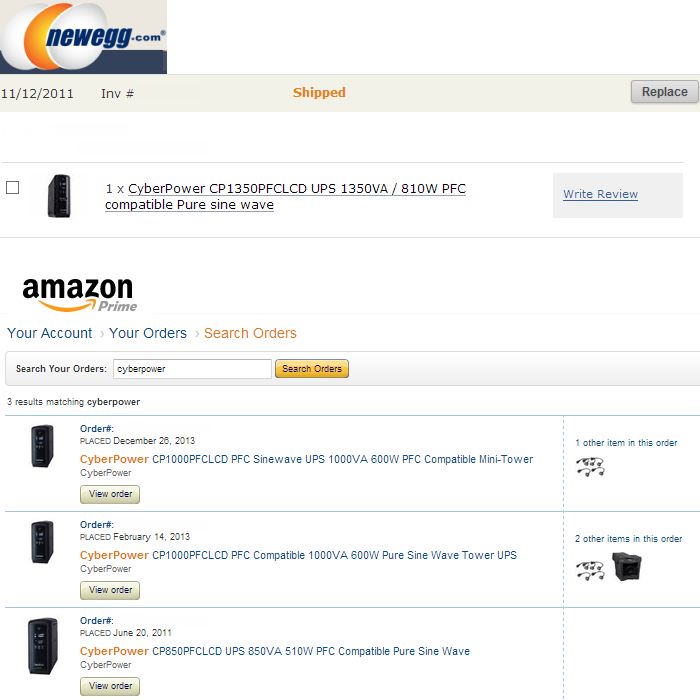 CyberPowerSystems.com's complete specifications, function and setup guide, and manual. 1350 / 7.0 AH (Amp Hours) x 2 = 14.0 AH, dimensions 3.9" x 10.4" x 14.2". 1000 / 9.0 AH (Amp Hours), dimensions 3.9" x 9.1" x 10.4". 850 VA / 8.5 AH (Amp Hours), dimensions 3.9" x 9.1" x 10.4". and review the full disclosure seen in the bottom-right of every TinkerTry.com page. "Can I hookup a surge strip to the UPS unit? Surge strips cannot be installed before OR after the UPS unit. Doing so will void the UPS’s warranty. If you require additional units, please upgrade your UPS to a unit that has more outlets. If you need a longer input cord, you can purchase a UL certified extension cord that is rated for the respective current of the unit. This cord MUST be a single-outlet extension cord."